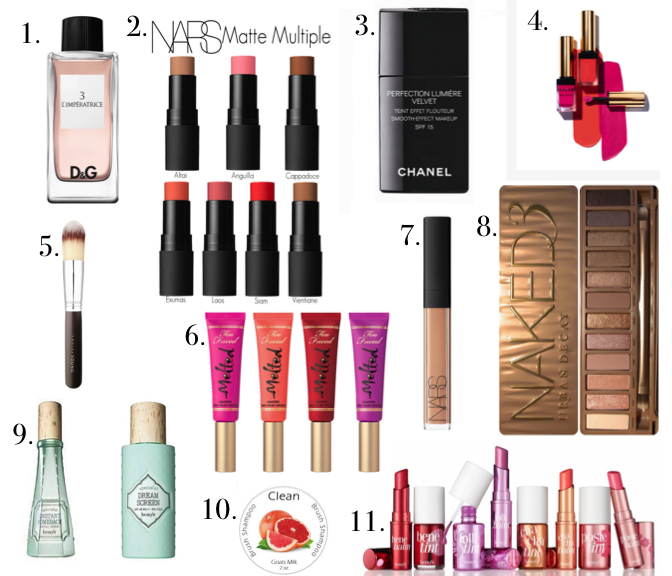 This month we have a particularly long beauty wish list! So here goes! I've also created a board on pinterest of the wish list which you can see HERE. 1. D&G L'Imperatrice - this came up on my March favourites. It is an awesome scent for this time of year. Really light and fresh. I just found out though that this is apparently being discontinued! So I'm on the hunt for this, I've only got a few uses left in mine and I'm not about to go completely without forever, no sir! 2. NARS Matte Multiples - these have been a 'want' of mine for the longest time. I don't really have much in the way of NARS products, literally just one eyeshadow duo, so these may already be on the way in a cheeky little order I've placed… Expect a little write up/video on these coming soon! 3. Chanel Perfection Lumiere Velvet Foundation - the first time I heard of this was probably no more than a week to ten days ago and I can't stop thinking about how much I want it. The Vita Lumiere Aqua has been a foundation I've been eager to try, but I never took the plunge and bought it because I wasn't sure it would be flawless enough or matte enough for me. Don't get me wrong, I'm not a total fan of a completely matte face. But as someone who can become quite shiny throughout the day, a matte or velvet finish foundation is usually what gives me my favourite type of skin. I can't see myself holding out too long before buying this one. 4. YSL Kiss and Blush - I am a great fan of the YSL glossy stains, so it is not surprising that these have caught my eye. I'd be interested to try them to see how they work on the cheeks as a blush, but colour range and packaging already seem to be ticking boxes for me. 5. Louise Young LY34 Brush - my favourite way to apply a base is with a brush. I'm normally in a rush and don't want to get my hands messy by blending with my fingers. Whilst the Real Techiniques buffing brush (an all time favourite of mine), still does the job just fine. I would like a second brush to alternate between when I perhaps haven't had a chance to give mine a good clean. This brush is massive, and after seeing Anna from ViviannaDoesMakeup loving this brush, it is definitely the next brush I want in my collection. 6. Too Faced Melted Lipsticks - surprise, surprise. I am lusting after more liquid lipsticks. The colours in this range look awesome and reviews have also been impressive. The only thing that might make me leave these off the 'to buy' list? The price, £19! A little hard for me to justify when there are some amazing liquid lipsticks out there for a fraction of the price. 7. NARS Radiant Creamy Concealer - another one that may already be on its way to my door, stay tuned to hear more about this! 8. Urban Decay Naked 3 Palette - you may know that I got the Naked 2 palette a little while ago and as much as it has to be favourite out of the 3 in terms of colours, the Naked 3 keeps making it's way onto my shopping list. The rose-hues in the palette are shades that I don't have much of in my own make up collection, hence the intrigue. I'm just waiting for a some justification for this, a £37 palette is not something that should be bought on a whim for me! 9. Benefit Instant Comeback and Benefit Dream Screen - Benefit's skincare is something that is too easily over looked in my opinion. This tends to happen a lot with make up brands. Understandably, it is hard to believe that skincare from a brand that specialises in make up is something worth investing in. However, these two products which launch at the end of next month, are not to be sniffed at! Admittedly, I'm yet to try them out properly as part of my skincare routine (hence them being on the wish list), but what they claim to do is certainly something worth trying. Instant Comeback is a serum, whilst Dream Screen is SPF 50 with the consistency of an extremely light weight moisturiser. More on these will follow! 10. Clean Solid Brush Shampoo - cleansing brushes can be quite the ordeal when you have a large collection, so the idea of a solid brush shampoo that you can swirl your brushes in and then rinse is just what I am in need of! A simple, and substantially less messy way of cleaning my make up brushes. As I'm sure I will get use out of this, it may be something I can justify purchasing sooner rather than later! 11. Benefit Tinted Lip Hydrators - another launch from Benefit due late next month, tinted lip hydrators. Cute, right? There's one after each of their iconic tints. These will definitely be a welcome addition to my make up bag. I'm eyeing up the lollibalm and the chachabalm myself. And one other addition to the wish list (one that I unfortunately couldn't fit on the image once I remembered it!) is the Bourjois Rouge Edition Velvet Lipsticks! A very raved-about release from the drugstore brand. Like the Too Faced Melted Lipsticks, these are long wearing liquid lipsticks - a type of lipstick which is fast-becoming my favourite! I'm particularly keen to try the bolder shades in this range. Strong colours with minimal maintenance. Yes please!